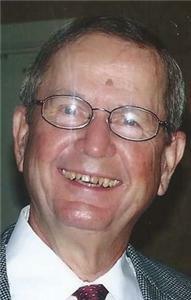 Martin Frederick Stutz, 80, of Cleveland, TN, passed away Tuesday morning, August 26, 2014. Born in Chattanooga to Horace and Elsie Stutz, Martin moved to Cleveland in 1969, where he raised a family and became a much-loved member of the community. He was a successful business owner, establishing and running Business Equipment Company for more than 30 years. Before that he worked for Pioneer Bank (Chattanooga) and Royal Typewriter (Roanoke, VA). After selling his company, he worked as a real estate agent for Coldwell Banker. Martin loved southeast Tennessee and called it home for most of his life. He attended the Lutheran Elementary School in Chattanooga, graduated from Chattanooga Central High School and earned a BS degree from the University of Chattanooga, where he belonged to the Lambda Cho Alpha fraternity. He was a faithful member of First Lutheran Church of Cleveland where he served in various positions. He served as a reserve in the Tennessee National Guard for 5 years. He was a charter member of the Cleveland Sertoma Club; a past member of Kiwanis Club and Cleveland Chamber of Commerce; and a current member of Cleveland Country Club . He loved people and sports and never met a stranger. He loved his UTC Mocs and the game of golf and all of his golfing buddies. He is survived by his wife of 26 years, Sarah; two sons, Allen Stutz of Salt Lake City and Gary Stutz of Denver; his step-son, Wayne and (Regina) Brantley; step-daughter, Michele Culpepper of Hixson and Tullahoma, respectively; seven grandchildren, Devon and Jenna Stutz, Blake and Sarah Culpepper, and Piper, Bree and Tia Brantley; his brother, David (Barbara) Stutz of Rome, GA; mother–in-law, Sarah B. Harris; sister-in-law, Rebecca Harris; brothers–in-law, Steve Rouse and Eddie (Gaye) Harris, all of Cleveland; many nephews, nieces and cousins; and two special great- nieces, Megan and Morgan Rouse of Cleveland. The funeral will be held at 11 a.m. on Friday, August 29, at First Lutheran Church with Pastor Robert Seaton officiating. There will be a private memorial at 5 p.m.
His family will receive friends from 5-8 p.m. on Thursday, August 28 at Fike Funeral Home, who has charge of the arrangements. In lieu of flowers, the family request that donations be made in Martin’s memory to First Lutheran Church, Stutz Memorial, Hospice of Chattanooga or Habitat of Cleveland.